Accumulated Battle Points are used to determine incremental rewards during the tournament. These rewards may consist of: Gold, Crystals, Food, Essences, Crafting Supplies, and the tournament exclusive Armor of Aeonic Fire, Frost Dragon. Every time a trainer reaches one of these Battle Point totals, the reward is received immediately. The trainer’s overall place in the tournament is also calculated and a final prize is given based upon this placement. This final prize may consist of Gold, Crystals, Crafting Supplies, and the tournament exclusive Two-Humped Dragon, Armor of Eternal Flame, Gloom Dragon. 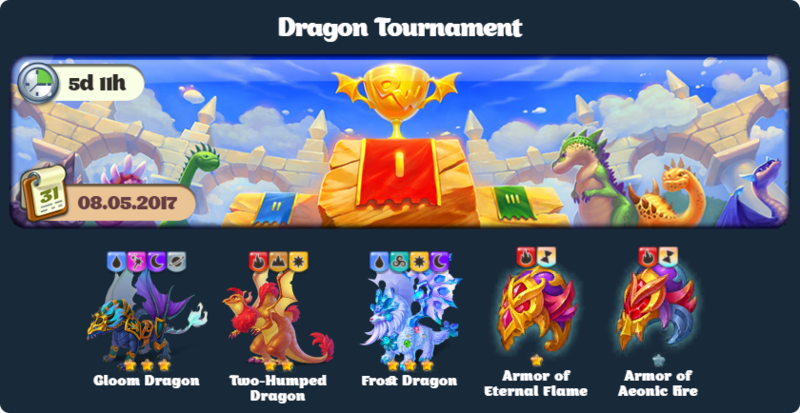 The ultimate Dragon Tournament prize is the tournament exclusive Gloom Dragon, which is only awarded to the top 15 finishers (most accumulated Battle Points) in the tournament.